29-Sep-2006 -- Yesterday evening we had left the port of Bahía Blanca, Puerto Ingeniero White, after loading 26,500 tons of barley for the "Quilmes"-Breweries in Colombia. The destination of the cargo is Cartagena, where we will arrive after 16 days of navigation. This morning we visited 39S 59W, about 53 km SW of the port of Necochea/Quequén, another important centre of Argentine cereals exports. 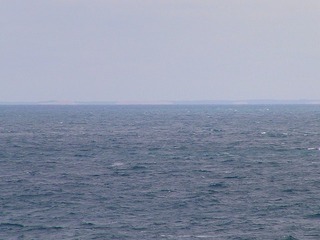 The coastline which can be seen from the Confluence is composed entirely of featureless sand hills from 15 to 25 metres high. The views to the NW, North, and NE are thus quite similar. At Bahía Blanca the major attraction to watch are the thousands of seals, which populate the sand banks and buoys along the navigable channel up to the port.